A getaway in Maine is going to be one to remember for a lifetime. There are so many beautiful towns it is hard to choose where to visit. A trip to Castine will truly amaze and wow the most seasoned travelers. Read below for our many accolades and plan your getaway to our stunning Castine, Maine hotel. 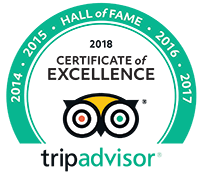 The Pentagoet Inn is honored to receive the TripAdvisor Hall of Fame award for receiving the Certificate of Excellence for five years in a row. This awards celebrates hospitality businesses that have earned great traveler reviews on TripAdvisor for continually delivering a quality customer experience.